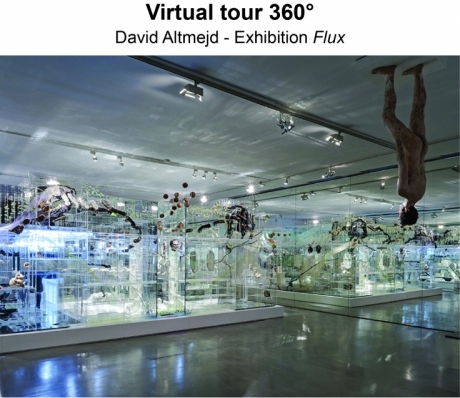 At ARC the Musée d'Art moderne de la Ville de Paris is presenting Flux, the first French retrospective of the work of David Altmejd. The exhibition includes unshown and older pieces, together with his most recent and certainly most ambitious monumental sculpture, The Flux and The Puddle (2014). The exhibition takes the form of a work in its own right, with creatures sometimes combining the anthropomorphic and the animal: half-vegetal, half-mineral hybrids that make play with the architecture of the museum as they spin out their arachnoid labyrinths. David Altmejd's approach to sculpture is characterised by its wide variety of materials and a longstanding interest in the natural sciences and architecture. Altmejd works in direct contact with psychic flux. In his "definitive dreamer's" world action and consciousness merge: he dominates the grotesque and the abject, combines aesthetics and 'glamour' and uses his sculptures to explore the worlds of dream and nightmare in a mingled ambience of fascination and terror. The exhibition reveals a group of deliberately contradictory artistic accomplishments – conceptual and processual, virtuoso and readymade – while the flow of light from countless natural and artificial sources is split by the mirrors, shattered or intact according to the sculptor's whim, that it encounters. Close to the cinema worlds of David Cronenberg and David Lynch, and marked like all artists of his generation by the works of Matthew Barney, Altmejd combines mystical and alchemical elements with an aesthetic torn between structure and dispersion. A theatre of shapes and organs in gestation, and of crystals in formation, his work functions by strata, patiently assembling timeless sediments in a sudden, exhilarating, dreamlike explosion. Born in Montreal in 1974, David Altmejd lives and works in New York. After studying visual arts at the University of Quebec in Montreal, where he majored in drawing and painting, he graduated as a sculptor in 1998. Fascinated by biology and the cinema of the fantastic, he moved to New York and in 2001 took out a fine arts degree at Columbia University. In 2007 he represented Canada at the 52nd Venice Biennale with his installation The Index and showed at the Istanbul and Whitney Biennials in 2003 and 2004 respectively. The exhibition will then travel to MUDAM in Luxembourg (7 March – 31 May 2015) and MACM in Montreal (18 June – 13 September 2015). A generously illustrated artist's book of 96 pages will be published by Paris Musées to mark the exhibition. It will contain an essay by Louise Déry and a conversation between David Altmejd, François Michaud and Robert Vifian. The David Altmejd’s app is now available ! Visit the exhibition with the comments of the artist himself !